A perfect mix of style and functionality. · Arai SFL (Super Fibre Laminate). · Wide channel ventilation system. Featuring shell upgrades in the V3, ventilation and an increased field of vision is optimized. With graphics designed by Drudi Performance. Available in 6 sizes. Flares out for easier putting on and taking off. Super fiber provides more comfort than other shell materials, yet is still strong and lightweight. Side vent exhausts: Produce low pressure behind the rear vent for better hot air extraction. Integrated in the shell for better aerodynamics, reduce wind noise en prevent buffeting at speed. 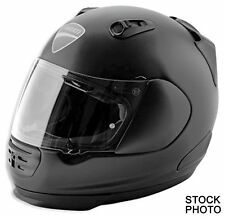 Manufacturer: Arai. Marke Ducati. Shell in fiberglass - high impact strength. very good aerodynamics - low noise level. Arai ScLc construction. Arai SFL (Super Fiber Laminate). DOT and Snell 2015 Rated! CODE : 981047066. MPN 981047066. Born on the top of the range model racing < span class = "notranslate" > X-lite, X-803 Ultra Carbon Ducati Speed Evo. Effective ventilation system RAF (Racing Air Flow). Produced by Arai for Ducati. Marke Ducati. Air Wing spoiler is easily and safely set - even when wearing gloves. Five different positions allow the right choice for every situation: reducing turbulence and air resistance. 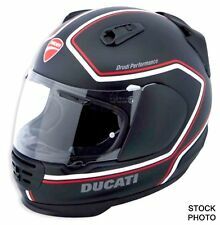 The well-known and popular Schuberth C3 now also in the Ducati Design. Marke Ducati. integrated sun visor. anti-misting Pinlock visor. Color:Black / Tricolore. Chin strap with quick release. Size: XS (52-53). DOT and Snell 2015 Safety Rated. Internal sun visor. Material: injection molded carbonglass (fiber glass carbon fibre) interior fabric Dry Comfort. MPN 981036812. EAN Non applicabile. Colore principale Nero. CODE : 981037003. MPN 981037003. Visor: Polycarbonate, transparent scratch-resistant visor system. The cover made of fiberglass and carbon provides strength and lightness, while the Interior detachable and washable gives great comfort. Outside SFL (Super Fiber Laminate). Ergonomic shape. plus Ventilation: The rear air intake Air Conductor produces an intense vacuum effect and therefore improve the ventilation effect. From the exclusive air inlets to the visor, the outside air is directed to the end region, without the need for holes in the outer shell and without impact on the absorbent interior. Fiberglass, SFL Technology. Marke Ducati. Air intake at the chin so the anti-fogging of the visor is supported. Helmart Integral. Material Fiberglas. Farbe Tricolore. Lackierung Glanz. Größe L (59). CODE : 981047063. MPN 981047063. Born on the top of the range model racing < span class = "notranslate" > X-lite, X-803 Ultra Carbon Ducati Speed Evo. Effective ventilation system RAF (Racing Air Flow). CODE : 981031992. Compatible with. CODE : 981042004. MPN 981042004. The removable and washable inner padding, the sun visor with UV 400 protection and the reflex inserts for greater visibility complete the features of this product with a minimal-chic design made by Drudi Performance exclusively for Ducati. CODE : 981042203. MPN 981042203. Outer material: injection molded composite laminated fibers. Upholstered strap with D-ring closure for a more secure and comfortable fit. Of course, the white front strip, the Italian national colors in tricolor Style and the Ducati Corse logo should not be missed. Arai Side Air Channel: Ventilation effect through the opening at eye level on the outer channel. Marke Ducati. To secure Racing clusure in double-D version with push button to the tab. Removable, washable lining Dry-Cool material, cooling and light. Material Fiberglas. Farbe Rot-Weiß-Schwarz. Lackierung Glanz. Chances are that through our international network of high quality suppliers we will be able to source the item you are looking for. Clutch Kits. Brake Light Switches. Helpful Links. Yamaha YZF-R125.